21) This was once a station on the old South Manchester loop line, and then Sainsbury's built their new supermarket around it. Recently, they said they wanted to demolish it. Where is it? 22) This former hunting lodge at Lyme Park commands stunning views across south Manchester, Cheshire and Derbyshire. It was opened to the public this year by its owners, the National Trust, but what's its name? 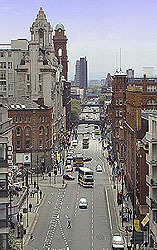 23) This distinctive bridge is on Store Street, not far from Piccadilly Station. 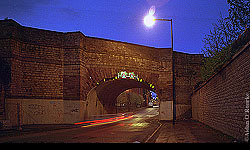 It was once drawn by LS Lowry and is now photographed by EWM. But what does the bridge carry across the street? 24) This man was largely responsible for the redevelopment of Castlefield. He's a bookmaker by trade, and became involved in property development through his company Castlefield Estates. 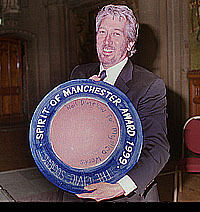 In 1999 he was awarded the Spirit of Manchester award by the Manchester Civic Society. What's his name? 25) This market place is part of a conservation area. In which Greater Manchester town centre will you find this scene? 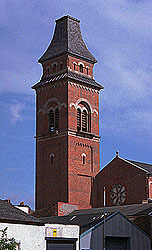 26) This church was renovated as part of the redevelopment of the oldest industrial district in the world. What's the name of this district? 27) This is the view from the top of the Central Library. We're looking towards the University district. The street and road ahead of us are named after another famous university - what is it? 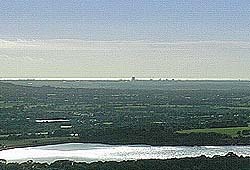 28) This is one of the few places where you can see Manchester city centre and the Irish sea at the same time. Where did I take this photograph? 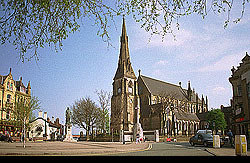 29) This brand new street links Manchester's re-invented "medieval" quarter with St Ann's Church. What's the name of the street? 30) Here we see the Shambles reconstructed on its new site next to the Cathedral. The Shambles consists of two pubs - one is called The Old Wellington Inn. What's the other one called? That's all from the EWM end of year quiz. Let me know how you got on, and once again, I hope 2000 is enjoyable and successful for you!